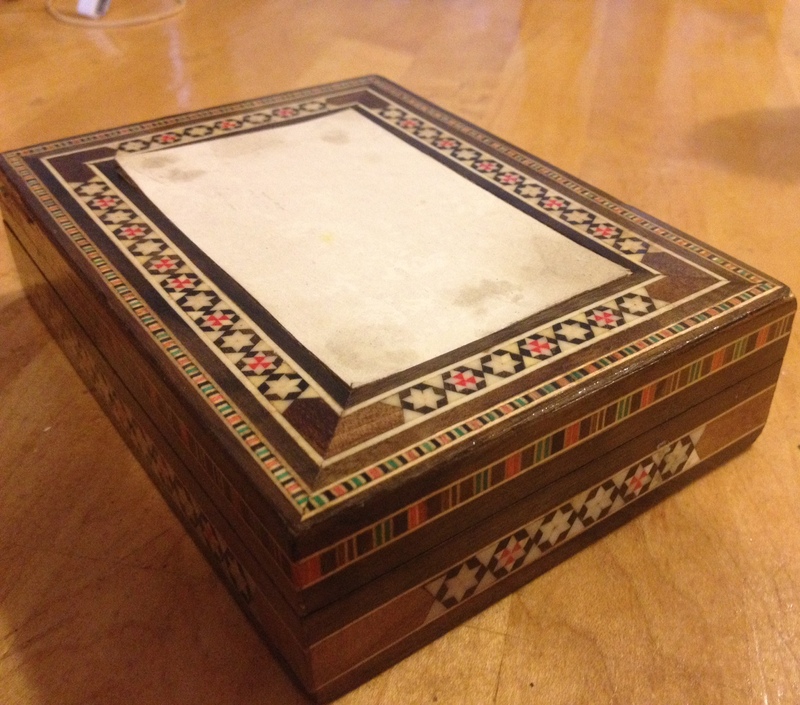 What is a six-pointed star–widely known as the Jewish Star, the Star of David, or the Shield of David–doing on a box made by a Muslim in a country with virtually no Jews? As it turns out, the association between the six-pointed star and Judaism is a fairly recent one. The same shape was a popular decoration motif in the Middle Ages and it could be found in churches and mosques as well as in synagogues. It is not clear why it became associated with Jews, or why we began to refer to it as the “Shield of David” (“Magen David“). It has been a Kabbalistic symbol since the 16th century, sometimes called the “Seal of Solomon”. Some think it became associated specifically with Jews because of the patches we were forced to wear in the late Middle Ages, which were sometimes shaped something like the six-pointed star. (In Spain, before the expulsion, it was a red circle.) In the 17th century it appeared on synagogues, probably used the same way crosses were used to identify Christian places of worship. At any rate, it was only in the late 19th century that the Star of David became a universally accepted Jewish symbol–when the Zionist movement adopted it. Apparently there was some controversy over using it as the symbol in the center of the flag of the State of Israel. 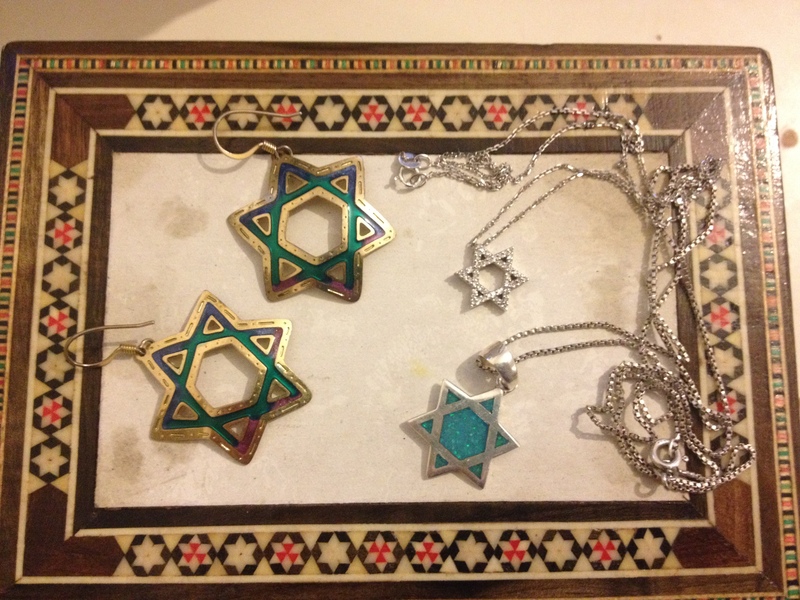 In any case, as you know, today it is exclusively associated with Jews, and a popular motif for clothing or jewelry expressing Jewish identity. As I’ve mentioned, the original symbol of Jews was not the Star of David, but the menorah; the seven-branched candelabra that was lit in the Temple. It is that symbol that is displayed on the Arch of Titus to identify the slaves portrayed there as Judeans. Another symbol commonly associated with Jews is the chamsa, usually spelled hamsa. Actually, it’s a widely used symbol of good luck in the Middle East and North Africa, and not exclusively for Jews. The right hand is a positive symbol in many cultures. Jews in particular associate the five fingers with experiencing God with the five senses, or the five books of the Torah. 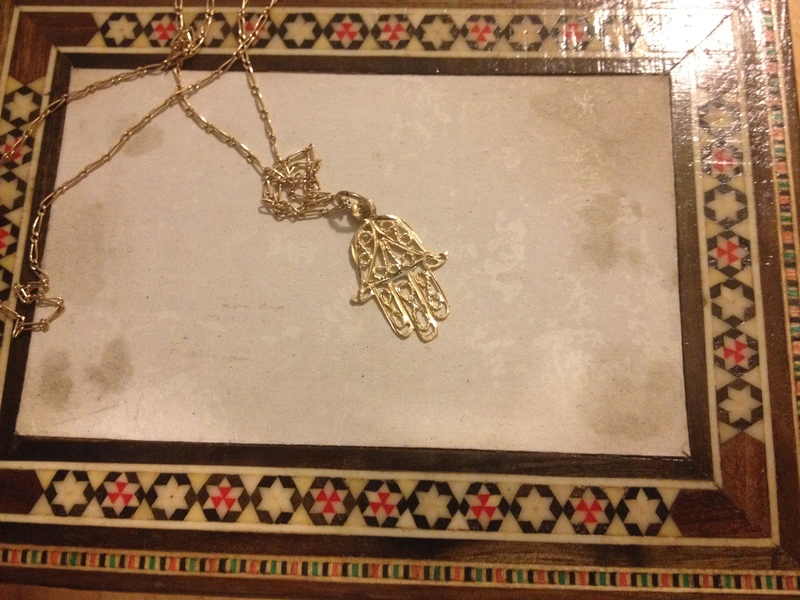 The word “hamsa” means “five” in Arabic. A more exclusively Jewish symbol is the word חי, “chai“, which means “live”. In Hebrew, each letter corresponds to a number. The numerical value of the letters ח and י is 18, so 18 is considered an auspicious number and Jews often give gift money or charity in multiples of 18. As you know, Jews love life, and the typical Jewish toast is “L’chaim”–to life! We also often use other Hebrew writing–quotes from the Tanakh or from rabbinic writings–as decoration. You can see this on the walls of many ancient (and modern) synagogues. 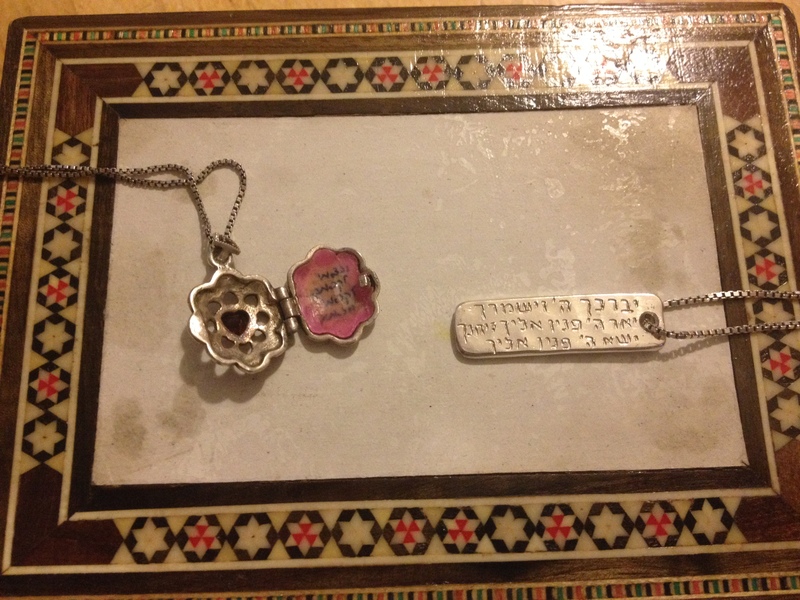 Pictured here are a necklace my in-laws bought me with the Priestly Blessing engraved on it, and a locket in which I inserted a favorite phrase from a poem by Rabbi Judah the Levi, an 11th-century rabbi, poet, scholar, doctor and philosopher who lived in Toledo. The phrase in the locket reads, “And when I came out towards You, I found You coming towards me”. 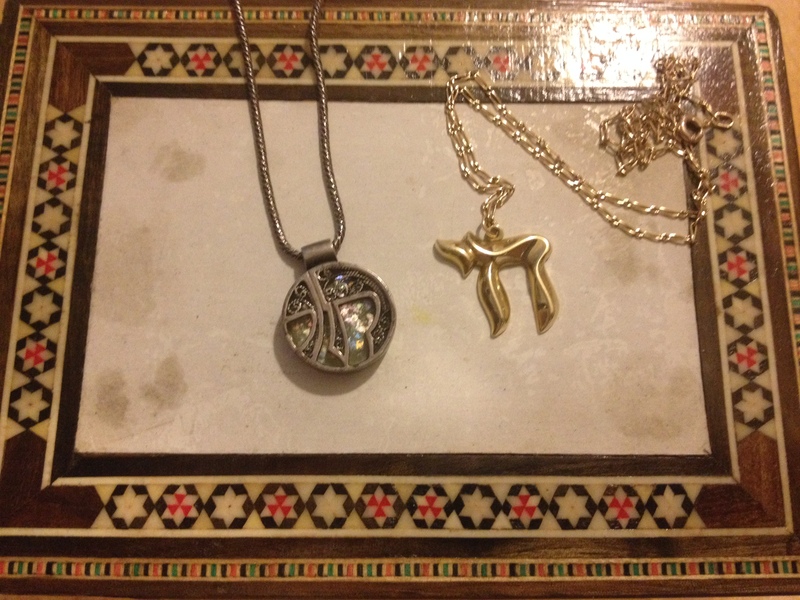 The Priestly Blessing on the other pendant reads, “May God bless you and keep you; may God shine His countenance on you, and bestow goodness upon you; may God lift His countenance to you”, and on the other side of the pendant, “and grant you peace”. Usually they appear rounded on top. Not sure why. They usually either have the first ten Hebrew letters representing the Ten Commandments, or the first two or three words of each commandment, as pictured here. 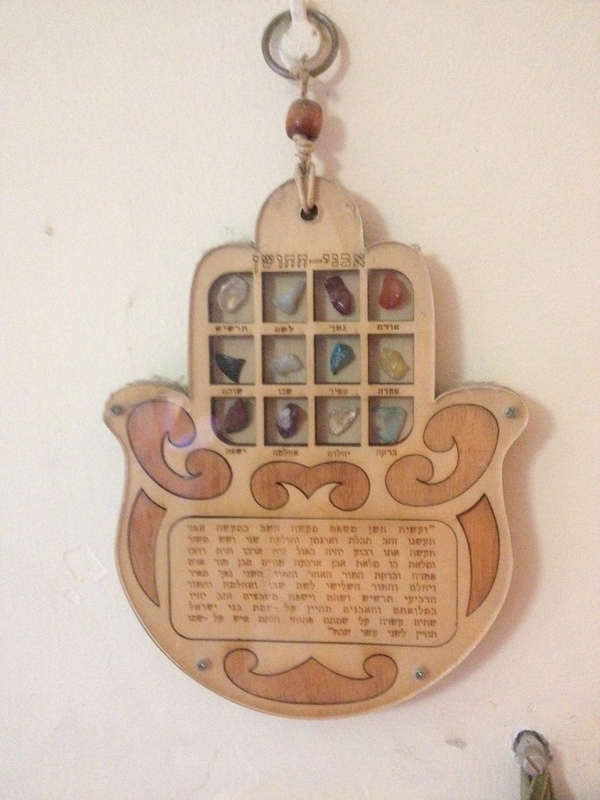 All these symbols are incorporated into our decor, jewelry, or household items, and can be found pretty much everywhere in Israel. 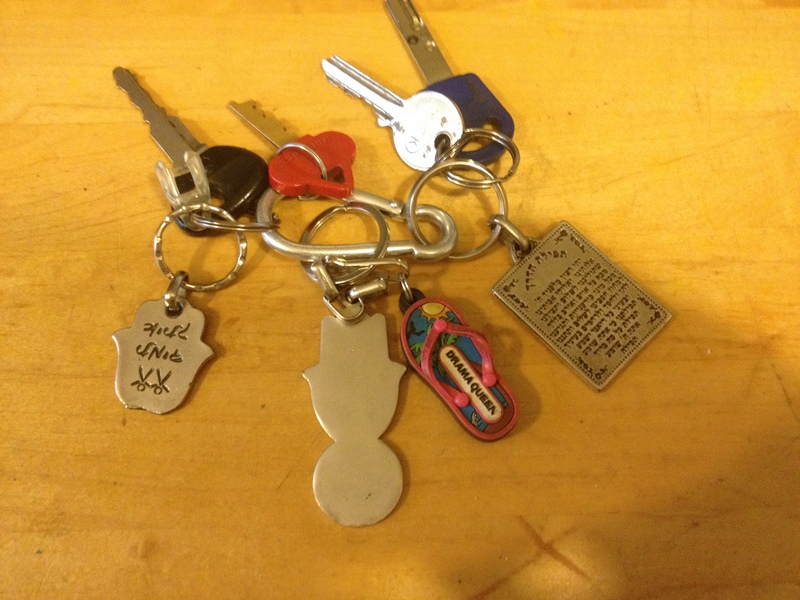 Like, for example, my random assortment of keychains. While we’re here, I have a great story about that Hamsa with the coin on the end. In Israeli supermarkets, you need a five-shekel coin to use a shopping cart… or something shaped like a five-shekel coin. So they make keychains like the above that you can use instead, so you always have one with you and don’t need to count on having the right change. The other Hamsa used to have one of those coins but it broke off, and without having a replacement I was sick of needing to find a five-shekel coin every time I went grocery shopping. 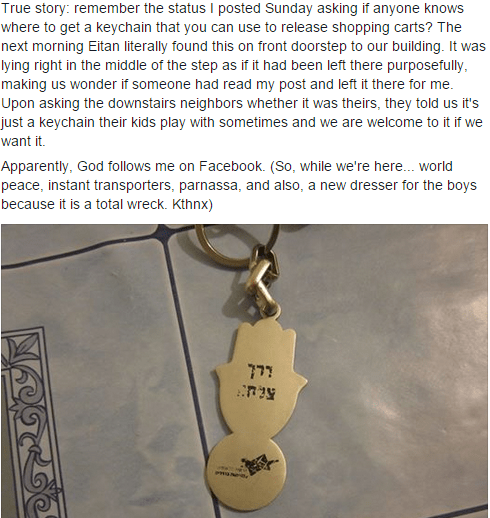 So I posted on Facebook asking if anyone knew where to get one of those keychains. Here’s what I posted the next day. Blog readers: Which is your favorite? Tell us about symbols from your culture or religion!